Seven Little Australians was published in 1894 but first came to my attention in the mid 1970's thanks to a wonderful 10 part tv series on the ABC. I was only about 8 or 9 at the time but I was blown away by the story. After the tear-jerker tenth episode ending, I sat down for my first reading of the book. I have now reread Seven Little Australians a handful of times. Each time it makes me cry. Correction - every single time I have to put down the book so I can sob out loud! 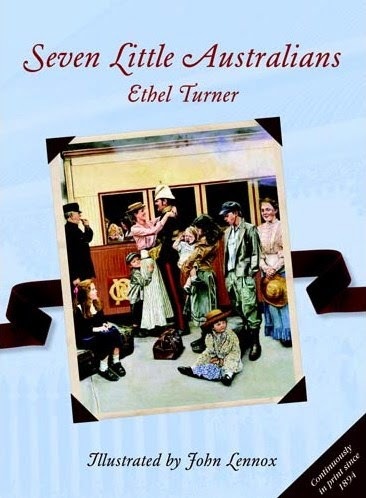 Seven Little Australians is one of the few Australian books that has never been out of print. And the only Australian book to have been in continuous print for over 100 years. It is set in suburban Sydney in an area called Lindfield. In the 1890's this area was completely rural. Now it is in the middle of the northern suburbs area of Woodlands, Killara. The story follows Judy and her 6 siblings and step-siblings. They're an unruly bunch, allowed to run wild by a too distant father and a too young step-mother. They play pranks, argue and tell tales on each other. They go to Luna Park for an outing and have picnics. They sneak into your heart and take up life long residence there! The young actress who played Judy in the ABC series is Jennifer Cluff. Years later I moved to Mudgee to take up a teaching position and learnt that Jennifer was a Mudgee girl herself. I was delighted to learn that one of my best friends had gone to school with her and her sisters and that I had been teaching a number of her nieces and nephews. It gave Judy's story another lease of life to me. And now, thanks to writing this review for Flashback Friday (the one and only & original FF hosted by Lisa) I've discovered that there is now a Seven Little Australians park in Killara. But the old Turner home is another matter. Instead of becoming a national cultural & heritage centre celebrating the life and times of the author and the book it has been allowed to wallow in uncertainty awaiting a philanthropic miracle. To say that I can feel a visit to both park and house coming on is an understatement! Below is the youtube link to the first episode of Seven Little Australians from 1973. It's lovely to see a young Ruth Cracknell and Leonard Teale at work. Every time I visit your blog, I learn something new! I'm always fascinated to hear about books from this long ago that have never gone out of print! This sounds lovely, and I hope to get a chance to check it out! I've read Seven Little Australians at least twice I think. And I remember the tv series too- it would be interesting to watch it again. I had no idea about the SLA memorial park, it's definitely on my wishlist of places to go too now! Fascinating about the house. I've not read this one (which makes me feel like a Bad Australian), but I am currently reading the 'Billabong' children's series by Mary Grant Bruce, whose name seems often coupled with Turner's. Have you read those? Classic bush Australiana. Often tear-jerkerish too. I haven't read any of the Billabong books Vicki - now I feel un-Australian! !